If you follow a few of my blogs, you’ll know that I’m getting things ready to launch my own homemade soy candles collection. And since I’ll be in the wax business, I’ve been craving candles like crazy! Which is exactly what I ended up getting for my birthday from my husband and my mom…plus I did a little shopping on my own. This is mainly due to Yankee Candle having their Semi-Annual Sale, otherwise this would never happen. 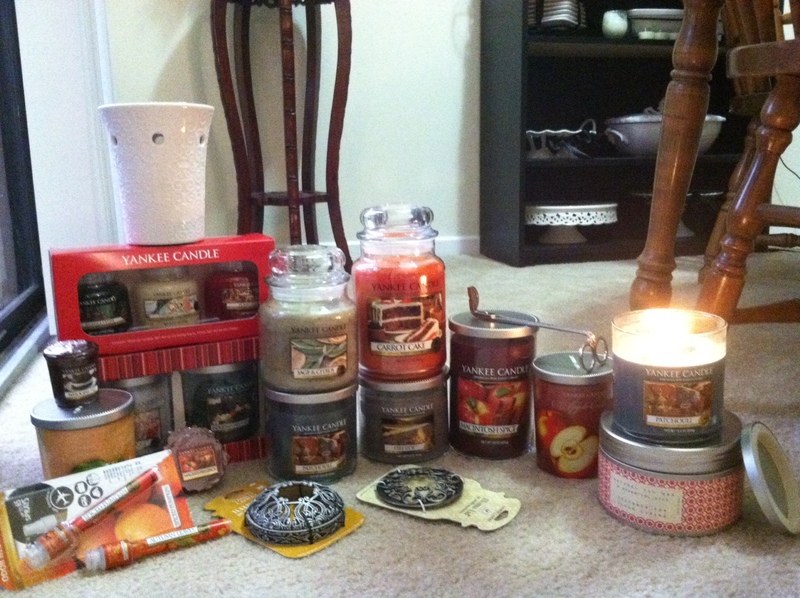 Needless to say, I’m good on candles for the next six months, at least! I haven’t ever done a “haul” type of blog, so I’ll try my best to describe these. The first one on the right is from Target, which my husband got me for my birthday. It’s Pink Magnolia, and I wouldn’t be surprised if this is being discontinued. I can’t find it anywhere on the website. I love it because it’s very light and fresh. Even though it has Magnolia in the name, there isn’t a heavy floral scent at all. My mom bought me quite a bit for my birthday, which I’m very grateful for! Patchouli: (my favorite), which is a bit earthy, it’s in the “fresh” category though, and to me, their version of Patchouli has a hint of spice in it. Fireside: To me, this smells a little like cologne, although light, and Yankee’s Midsummer Night. I can kind of smell a little earthiness but this fragrance doesn’t quite remind me of being by a fire. Sage and Citrus: I think they did a good job combining sage (or their version of it) with a light citrus smell. Perfect for summer! And I don’t usually go for citrus scents. Farmers Market: Another one of my favorites and perfect Fall scent! You can really smell the spice in this. Balsam & Cedar, Christmas Cookie, & Home for the Holidays Gift Set: What’s not to love? Balsam & Cedar smell like a Christmas tree. Christmas Cookie smells like a baked good. A little sweet but not overwhelming. Very vanilla, actually. And Home for the Holidays is just this amazing blend of spicy cozy Christmas memories. North Pole and Holiday Garland Gift Set: North Pole is definitely for peppermint lovers. Holiday Garland is hard to describe. It’s almost a smoother, lighter version of Balsam & Cedar. By the way, the Christmas season is the second thing I can’t wait for! All of these scents totally embody those Christmas memories and festive feelings! When I went to Yankee on my own, I got some definite Fall fragrances. Carrot Cake: You can really smell the spices in this. I love it and I usually don’t go for many baked good candles. There may even be a hint of icing. Macintosh Spice: This is an amazing blend of macintosh apple and cinnamon. Love this one! Totally embodies Fall for me. I also bought it in two tarts. Whoopie Pie: I got this in the votive to try. It’s in their new Fall collection. Again, I don’t normally go for baked goods, but this has a bit of a chocolate cake smell. I have yet to burn it, but I don’t think I’ll get this in a jar. I also got two odor neutralizing travel sprays in Spiced Pumpkin and Autumn Leaves. Soon I’ll be making my own candles and will be buying the competitor a little less…but there are definitely some classics here! Yankee does a great job at making scented memories for me! What are the things on the left that look like flashlights? lol! Room sprays. Spiced Pumpkin and Autumn Leaves.